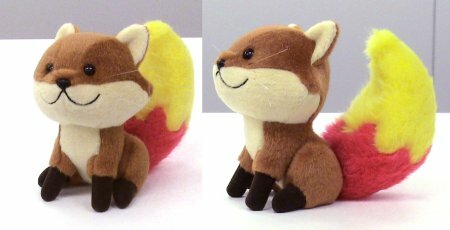 Foxkeh's Blog - Foxkeh plush toys! They're finally here! The Foxkeh plush toys! The adorable plush toy is already a hit in the office. But, we only have a few prototypes on hand, so we regret to say that the toys can't be delivered to each one of our Foxkeh fans... Could this go into mass production if there's enough public demand?! As this entry is about the plush toy introduction, we would like to show you how the Foxkeh doll was born. These rough sketches were drawn to visualize the plush toy. The poses and specifications were discussed using these sketches. The pose we decided on has Foxkeh looking up at us as he sits on a desk. Orthographic projections of the head and body viewed from the front, side, and above were sketched. Different body parts were drawn from various angles to detail the parts that were not visible in the original rough sketches. Colored illustrations based on original rough sketches were used to discuss the colors and fabric for the toy. It is difficult to express color gradation in plush toys, so two different illustrations were made, one with the original gradient tail and another with the two colored tail, with the latter to be used for the plush toy design. The manufacturer picked some sample fabrics and colors to match the colored illustrations. A short fur fabric was used for Foxkeh's body to make him lean, and a long fur fabric was used to emphasize his flaming tail. Here is the domestic prototype created by a craftsman. Bell-shaped head! Neck's too thick! Scary looking mouth! Snout is too short! Requests to correct these points were relayed via retouched and red-penned photos so that Foxkeh can look more like our intended design. After all the corrections were made, an order was placed to the Chinese factory, and here is the final design of the Foxkeh toy! The snout is longer and the mouth smaller, which makes him look sharper. It is different from the original illustration, but he is one handsome fox. What do you think? If you see him at events, have some fun with him! Next: Foxkeh on Spread Firefox! So what do I have to do to get one of the flaming-tailed prototypes? Is there a chance? We could provide a very good home in our postgraduate Computer Science lab for one of them. I need to make up with my girlfriend. and we all know how girls love kut little furry pets. me and おもこ would be happy to look after him while you go on holidays! oh so cute, please can I have one? So cute. Can I buy it? I love it - I'd definitely love to be able to buy one in the UK. Aw >.< Did it have to be made in China? There's more and more controversy over that these days, both quality control and human rights violations. Kya!!!!! 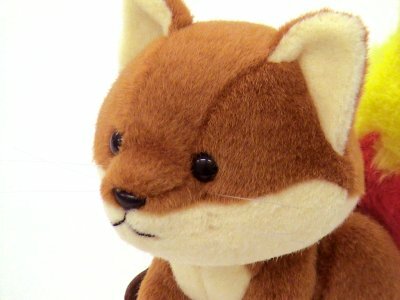 I want one of thisss >.< I'm really in love with foxkeh. Please, please, please make them mass production or something(and deliver them overseas). Or if you are really on the creative commons things, put the sewing pattern for them. Hmm... I like some of the original sketches better. He looks like a happier fox in those, and really, why wouldn't he be happy? it's kawaiiiiiiii, may I get one? Ohhhhhhhhh... I want one! There's any chance you gonna sell it and answer to international customers? If I make big sad puppy eyes and ask you pretty please with honey on top of it will you send me one to make me happy here in Brazil? Make a geekette happy! I would pay more if the tail were made out of better quality long fur rather than that fuzzy stuff. Otherwise LOVE him! I would kill for one of those. They are so cute! gime gime gime gime gime! I want to adopt him! Excellent plush. But his smile looks as if he is rather timid more than happy. I would still buy one regardless. Wow, he is cute. I read on the Japanese site (used an translator) that there is a larger version with the height of 160cm, but it seems that the smaller one is cuter. Wow, according to the Japanese site (used an translator), there's larger version at the height of 160cm, but I think the smaller one is cuter. I like his current smile. Awww :3 This guy is really cute! I would kill to get my hands on one of these Plushies! This beats the pants off of the Official Firefox Logo! Omg I want these!! Where can I buy this? I want this! Where can you buy? 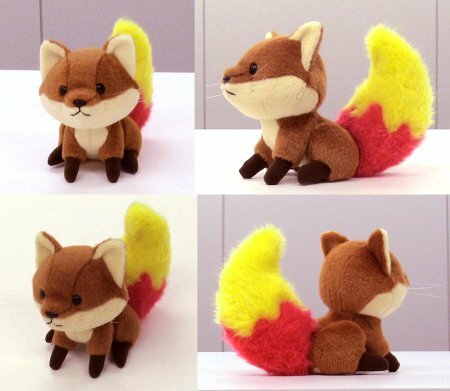 It would be totally awesome if Foxsuke plushies can be mass produced! Please have these made. I'll take a dozen! He’s definitely extremely cute. If only they could get his trademark smile perfect, he looks a bit upset. I sooo want one for my cube. OMG...that's so friggin cute! NEED one! This is simply adorable, I really want one = ( These are not for sale correct? I just got one! Yippi!! 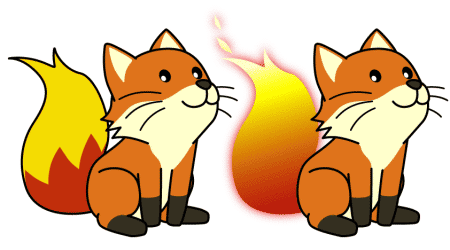 Oh, wow, I would dearly love to see these cute l'il fellas as the new official Mozilla Firefox plush. Any chance you might work on plushes for Thunderbird and Bugzilla as well? urgent to get 2.... if can... i wanna order or get info abt how to buy it. thx ! Sooo Cute!!! If they ever go on sale I will buy one, here in Alaska. He would fit in great at my biology university job! How can we spread the word? I'd pay any amount... well actually I couldn't afford much... but it being in the market would be a WISE choice I think it looks better without the smile thingy MUST HAVE ONE please???? I want one too.... so cute! I demand a Foxkeh plush toy. DEMAND. ooh, too cute!! I covet! Much covet. Might actually be able to get folks here at work accept Firefox if it's cuuuuute. Aww! if there are enough requests, will there be a Foxkeh plush toy coming soon? I want one soooo badly!!!! i don't have an e-mail yet... that shall change soon.... i collect foxes and the foxke would totally make all the other foxes jealous!!! PLEASE mass produce them!! Can't wait to get the Foxkeh plush toy. Hope it'll go to mass production soon. Any news of this product for sale? I so want one of those cute Foxkehs, pretty please? Can someone please contact me about making plush figures for characters we have already created?? It's soooo cute!! A shirt would be great, also. I would so pay 20 simolians for this wonderful piece of craftmanship. All lame jokes aside, you should defineatly mass produce these. If you think they are a big hit at the office just imagine what would happen once they are mass produced. I bet these things would sell like hotcakes. I know I would buy one for sure. 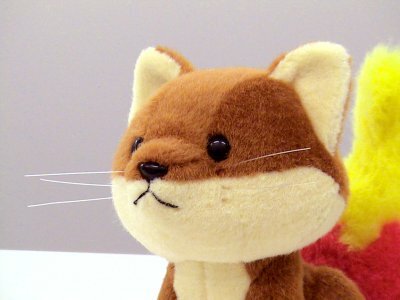 In our meneame's comunity (meneame.net is a Spanish digg clone) we DEMAND this cute plush, but... the Tail... It can be redesigned? PD: Sorry for my dirty english. I heard they're for sale...$900.00 each! Please sell these. I want to buy a few plus I know tons of people who would buy it. You guys could work something out and sell them through the Mozilla store or something. Oh, how adorable! I think you could keep the smile without it getting scary if you just keep the mouth small, similar to how it is now, but with a little curve upward added at the end. 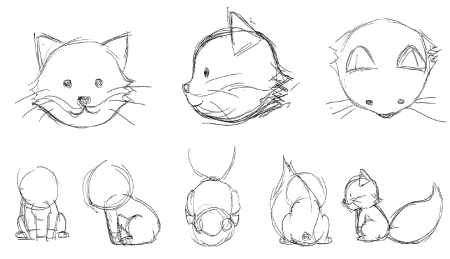 The original sketch is like that, but then in the prototype, the arc length and radius of the mouth were bigger than in the sketch, so its expression turned out a bit goofy rather than uber-cute. Thats so cute! Is there a way you can send me one to me? I really would like to have one. I really need one of those!!! I think it's safe to say that if these ever get mass-produced, I'd buy one in a heartbeat. HOLY CRAP! What do I have to do to get one of those? If these were mass produced, they would make millions. You know I have to say, I like the original better. The big happy grin, the way it was kinda looking up at you all happy and hopeful, like he's just ready to go and help you do stuff, not to mention it makes you just want to pick the little guy up and smoosh him. So really I dug the old head angle and the smile, but ah well, that's just me. I think you'll sell a ton. I also preferred the larger smile in the original sketches. The final product is very cute though. I want Foxkeh plush toy. Where the buy? OMG he's ADORABLE! I totally want to buy one!!! *cough* my baby still waiting...please, can i have one? Oh my! 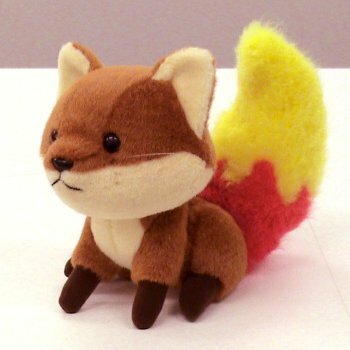 My girlfriend and I would both love to buy a plush foxkeh. What can we do to get one?! Oh, I'd love to have one! I think that you'd get a LOT of publicity if you did decide to manufacture them. People would see the cute little foxes, at, say, bookstores or department stores, or even computer stores, and buy the cute little foxes. Perhaps they will become interested in FireFox, and then download it. So, I think it's worth a try-- if there is no publicity (which I highly doubt), then don't worry, you'll have quite a few people that would buy the rest. Still, it's worth a try. For the sake of Foxkeh's fans, at least sell them on an online store! When! when! I want a Foxkeh plush. I want one too! Please make them available at the Mozilla Store! 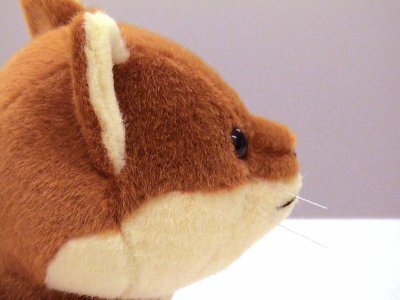 Love the Foxkeh plush-- I hope they go into production soon! So do want a little Foxkeh to cuddle. Please make more for sale in the Mozilla store! I saw the Foxkeh for the first time on an ArsTechnica link and fell in love with it in seconds. Its so cute! They would be a huge hit if they were ever manufacturered! Definitely would be worth selling I would buy at least 2! Yeah i would buy 2 if they were made available. Are there news about the mass production of this little and cute one? I would /definitely/ try to support this if you went into production. He's /crazy/ cute. I would buy. I would even pay ridiculous amounts of money for a few of these. How do I get that beauttiful plush? I want 2! of them..hook me up pleaseeeee! lol..thanks! 5 please! Cmon when you making them.